Happy Thursday! I am having a really hard time writing this post, why? Not because I am any less excited about the amazing purse I shared with you on Monday, but because I decided to pack my kids into the car and escape to warmer weather for Spring Break. Utah is being silly and holding tight to winter, but after a day in the car, we are enjoying the sun at my sister’s house in Arizona. 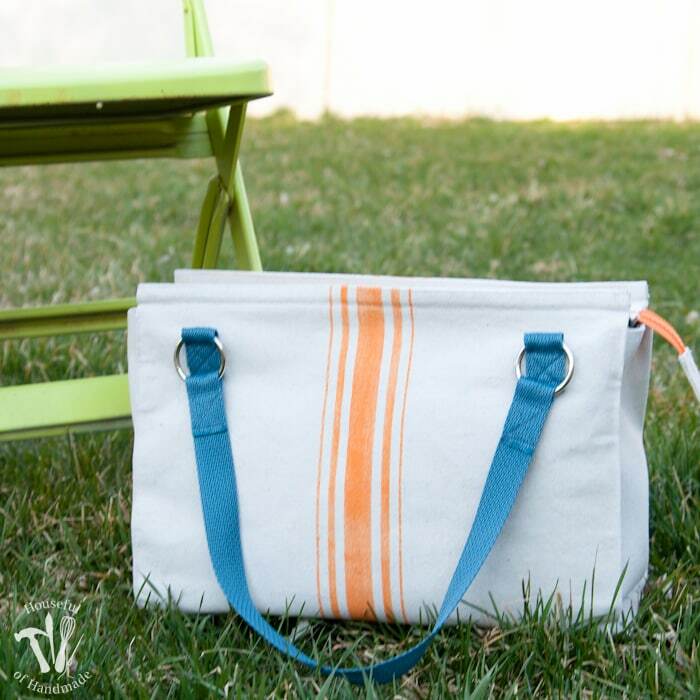 But I still want to share my perfect spring purse, so I am writing up the tutorial for this free printable purse pattern. 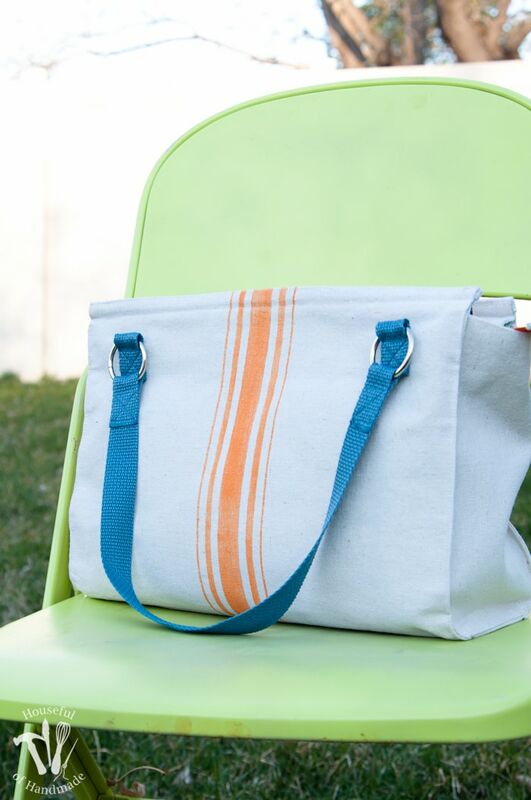 This vintage drop cloth inspired purse took me about 4 total hours to sew. I was figuring things out a bit as I was going, but I am an advanced seamstress, so I’d plan about 3-4 hours. This is also not a pattern for a first time sewer. I took lots of pictures to help you through the process, but there are some tight corners and curves that you need to know how to maneuver on the sewing machine before jumping into this project. If you are ready to jump in, let’s get going (this is going to be a long tutorial with lots of pictures). You can check out this post for lots of pretty pictures of the finished purse and my inspiration. I am sharing the free printable pattern in my library of free downloads that I share with my email subscribers. Click here to subscribe so you can download this pattern and so much more! 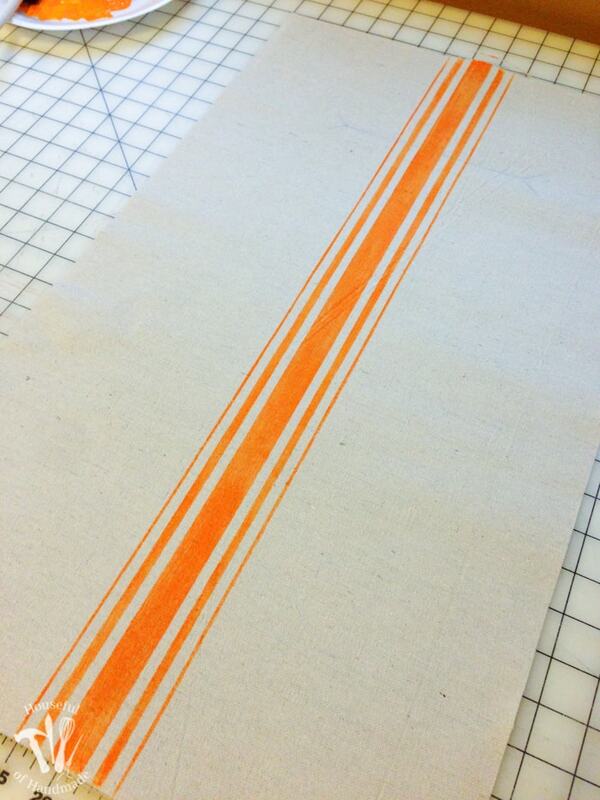 After you’ve printed the pattern, tape together all the pieces and then cut them out of your fabrics. Make sure to clip notches and mark the green dots. You will need to transfer the back pocket zipper opening to one side of the front/bottom/back piece. I did this by using some fabric tracing paper taped to the back of the pattern and then ran along the cut lines with my tracing wheel. 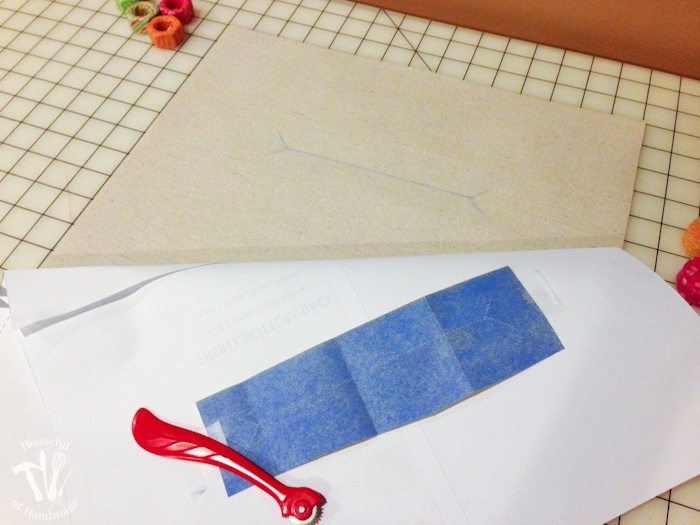 Once everything is cut and marked, it’s time to add the vintage flour sack detail. 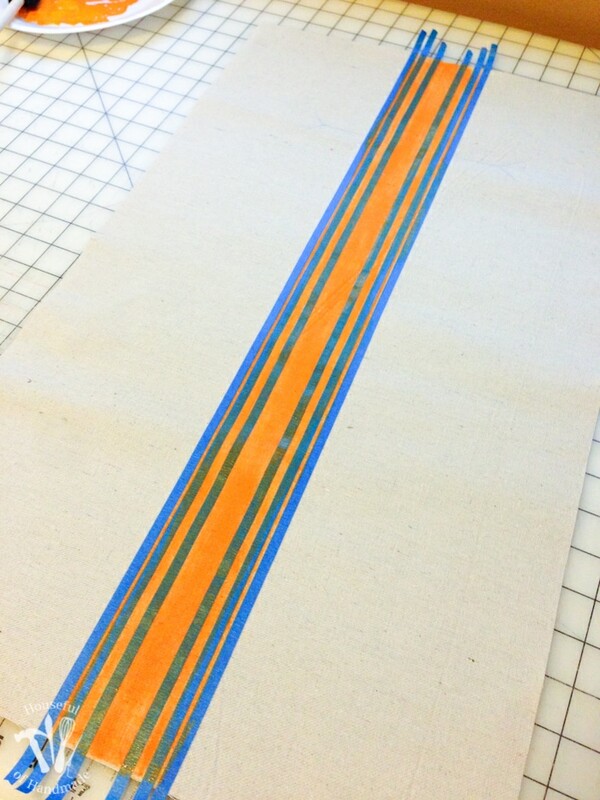 I made my stripes using some 1/4″ blue painters tape. Then I painted the stripes with some fabric paint using a foam brush to make it look a little worn and vintage. Let it dry then remove the tape and admire your work! Then iron it with a hot iron with no steam and a pressing cloth (to protect your iron) to seal in the fabric paint. I´m Ivana, from Brazil´s Southern Region (60 years old!). I love to sew bags and I´m very happy to try your template! Congrats and Happy Easter to you and your family! What an amazing project! I am so happy my bag pattern can help. Enjoy! You do not put the password in the tutorial, you will need to go to the Subscriber Library and enter the password there to get access to the downloads. I have subscribed to your newsletter and entered the tutorial with the password given. I have been through the tutorial several times and still do not see the materials and pattern piece measurements anywhere. Thank you. The tutorial will not give you the pattern, it is in the Subscriber Library. Scroll all the way to the bottom till you see the photo of the purse and click the words below that say Pattern or Supplies List for it. The one that says tutorial will you take you back to the tutorial in case you need it to walk you through the sewing process. This purse showed up in a Pinterest email today. I cannot believe how close it is to one I designed and made myself! So odd, or perhaps not… Yours is more elegantly constructed, though. Thanks Anne! This is a simple design but so much fun! Made it, LOVE IT! I am a total beginner (only project before this was camper cushions). Instructions were good enough for a total novice to follow. Thanks so much! Love my new purse! I am so happy you love it and the instructions were clear! I’d love to see a picture of your new purse, you can always email me or tag me on social media. fiz a inscrição, mas não sei onde coloco o código de acesso para fazer o download, muito complicado. The library is at https://housefulofhandmade.com/subscriber-library/. Sorry it was so complicated. I loved this Vintage Flour Sack. Congratulations! Very cute bag! Thanks for sharing with us. Thank you so much Denise. I hope you have fun sewing one too! Hello Helena! I am so happy you said hello. I can’t believe my little blog is being read in Brazil! I hope you enjoy your bag. Can you advise me where to download pattern pieces please? Heaven’s to Betsy – I subscribed but I cannot find the pattern for this bag. So sorry Melissa. The pattern for the bag is in the Subscriber library. After you enter your password, you will need to scroll all the way to the bottom of the page. It is under the Other section. Hopefully this helps! So sorry Michela. You will need to scroll all the way to the bottom of the library once you log in. The pattern is downloadable by clicking the link under the pictures of the purse. Hope this helps. Hello! You can sign up for the newsletter in the sidebar of my website. 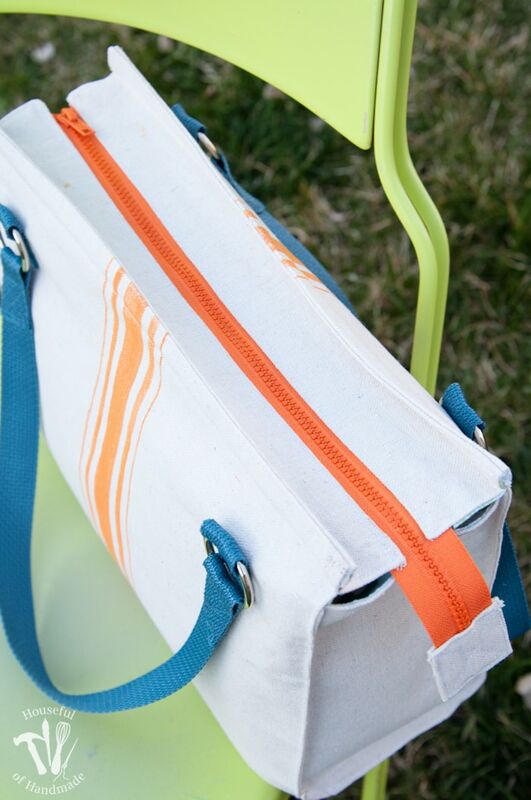 Then you will receive the link to this bag and make sure to see all the other fun projects. I have subscribed twice, found no password,no pattern… Is there a magic way to do this, I’m confused. The password is sent to your email address. Make sure to check the promotions or spam folder. I have just found this pattern in pinterest. I cannot wait to make it. I love the combo of orange and blue. My family will abandon me this weekend and I plan to make 2 this weekend. Thank you so very much for waking up my excitement. Thank you for your kind comment! A weekend sewing sound like my kind of weekend. Have fun. I was having some technical problems yesterday and this morning. They should be all fixed now and you should be able to access the library of printables now. Sorry for the issues. Hello Viviane, the pattern is available in the library of free downloads available to my email subscribers. Once you sign up, you will get a link to the library and the password. Then you can download the purse pattern. If you are having trouble with the password, please send me an email and I would be happy to help you! Very cute bag! Thanks for sharing the fabulous tutorial with us at Merry Monday. Not finding the pattern, I have searched, read what you told others, found no list of supplies. I’ve gone back to the library several times I just am not finding it. The pattern and supply list is at the very bottom of the library. You will see a picture of the open purse and then links below it for the downloads. I wish I was an advanced seamstress. I’m probably more advanced beginner! It’s super cute. Perfect for spring. Visiting from Show + Tell party. Thank you. If you have the patience to go slow around the sides, that’s the trickiest part, you could do it! Hey, your tutorial is great, but where is the actual pattern? I can’t get it to download??? Can you just send it to me or help? Thanks for the reply, I have signed up for the newsletter, and still nothing. Once you sign up you should receive an email to confirm your subscription, when you click to confirm it you will see the website address and password for the library of freebies. Your confirmation email may have went to your junk mail folder so make sure to check there. I’m so happy to hear Anette! Sorry about the confusion.